Brian Elliott is the Flyers’ latest goalie after signing a two-year, $5.5 million deal on Saturday. It's official: Brian Elliott is the latest Flyers goalie. In a seemingly lateral move that was expected, Elliott signed with the Flyers on Saturday, the first day of free agency. He and Michal Neuvirth will share the goaltending duties. Elliott, 32, signed a two-year year deal that has an annual cap hit of $2.75 million. The Flyers "were one of the teams on the cusp of making the playoffs last year," Elliott said in a conference call with reporters. "….I thought it was a really good opportunity to kind of take the next step and make the playoffs and do something special. I want to be a part of that." Late last season, the Flyers signed Neuvirth to a two-year extension with a yearly $2.5 million cap hit. Elliott and the 29-year-old Neuvirth, considered "bridge" goalies until Carter Hart or another talented prospect is ready to play in the NHL, will have a combined $5.25 million cap hit. A year ago, Neuvirth (then $1.625 million) and Steve Mason ($4.1 million) had a combined cap hit of $5.725 million. Neuvirth had a 2.82 GAA and league-worst .891 save percentage last season. 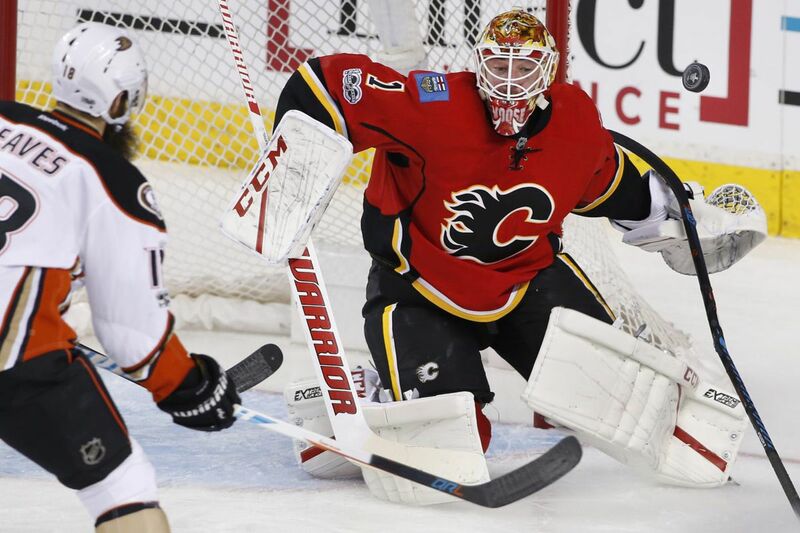 A former standout at the University of Wisconsin, Elliott is coming off a sub-par season with Calgary, where he went 26-18-3 with a 2.55 goals-against average and .910 save percentage in his lone year with the Flames. "Right before the season started, I had my first child, and it was a hard time to deal with everything, being away from my family," he said. "You feel like you need to get home right after practice and help out as much as possible. You didn't feel some of the connections (with teammates) you usually have when you didn't have a kid and you could go out to lunch and talk to the guys. It took a while before my wife and I were both comfortable…and once we got things figured out, we went on a pretty good run." Elliott said he was looking forward to "hitting the ground running" with the Flyers and "get to know those guys earlier and try to talk things out and know where they like to be and where I'd like them to be." Prior to last season, Elliott had a stellar five-year tenure with defensively strong St. Louis, compiling a 104-46-16 record with a 2.10 goals-against average, a .925 save percentage. He was selected to two all-star teams. In his first year with the Blues in 2010-11, Elliott led the NHL in GAA (1.56) and save percentage (.940). "When a guy like Ron Hextall calls," said Elliott, referring to the former standout goalie who is now the Flyers' general manager, "and says he's liked you for a long time and wanted to get you on his team, it's pretty special. I wanted to take advantage of that opportunity." Elliott called Philadelphia a "great city. I always loved playing there. It's such a great crowd. and atmosphere in the arena. I wanted to be on the home side of that." Drafted in the ninth round by Ottawa in 2003, Elliott struggled with the Senators and Colorado before finding his game in St. Louis. In his career, Elliott has a 2.42 goals-against average and .913 save percentage. Mason's career numbers: 2.68 and .911. The Flyers were tied for 26th (out of 30 teams) in the NHL with a .901 save percentage last season, and their 2.82 goals-against average was tied for 19th. This season, they are expected to have a young defense, one that could include two rookies (Sam Morin, Robert Hagg) and two players who each have just one full season in the NHL, Ivan Provorov and Shayne Gostisbehere. Unlike Mason, Elliott seemed content if he was in a platoon with Neuvirth, but said, "obviously, you want to play as many games as you can…If you're playing well, you'll be rewarded." As for the 29-year-old Mason, he is viewed as No. 1 goalie in Winnipeg, with Connor Hellebuyck, 24, as his backup. In a recent Philly.com poll that asked fans if they wanted Mason to return to the Flyers, 82 percent of the 1,200 respondents said no. In another development, the Flyers signed restricted free-agent center Mike Vecchione to a two-year deal ($900,000 cap hit). He is expected to battle Scott Laughton for the fourth-line center spot. It's a one-way contract, meaning if Vecchione is sent to the AHL's Phantoms, he will still receive his NHL pay. Vecchione, signed late last season as a highly sought-after free agent out of Union College, said he was "extremely happy and excited" to re-sign with the Flyers. "They have high expectations for me, but nothing is promised," he said. "I have to go in there and win myself a job." The Flyers also signed forwards Corbin Knight and Phil Varone to two-year contracts, providing depth to the Phantoms. Knight, 26, had 11 goals and 29 assists for the Phantoms last season, while Varone, 26, collected 15 goals and 36 assists for Binghamton.